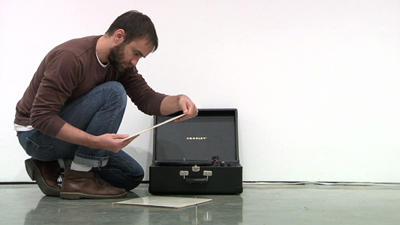 Brady Cranfield, The White Album and Sticky Fingers (White Album side), 2008, still from a two-channel video installation, variable-length loop. This exhibition is an up-to-date survey of sound art featuring an international group of artists: Brady Cranfield, Brian Joseph Davis, Holly Ward, Ceal Floyer, and Luke Fowler. The most intriguing works in the exhibition interfere with sound or music, or make no noise whatsoever. Fowler’s Pilgrimage from Scattered Points, 2006, a forty-five-minute documentary about the experimental musical ensemble Scratch Orchestra, depicts musicians working in collective cacophony; Ward’s Listening Post, 2008, reimagines a cold-war-era surveillance post via a Buckminster Fuller poem; and Davis’s Original Soundtrack, 2008 presents music from the opening menus of dozens of DVDs. Two works are the most successful in their play of sound and silence. Cranfield’s The White Album and Sticky Fingers, 2008, is a two-channel video installation that depicts the Vancouver musician sitting on a gallery floor listening to the Beatles’ 1968 album on one screen and the Rolling Stones’ 1971 LP on the other. Viewers cannot hear the music: Instead, one watches Cranfield put a record onto a portable player, look at the sleeve or liner notes, and, notably, tap away with his foot. A triple nostalgia is at work here: For the great moment of ’60s rock and pop (in our post-rock era), for vinyl (in the digital, iPod epoch), and for the dialectic of Conceptualism and Pop art signified by the artists who designed the covers for the two records: Richard Hamilton and Andy Warhol, respectively. Floyer’s Goldberg Variation, 2002, takes similarly iconic music––an aria from Bach’s Goldberg Variations––and layers all of the commercially available recordings one on top of one another. Installed in an insulated room, this “variation” is hectic, frenetic, and ultimately phatic. The work takes Bach’s structure and turns it into a fractured mirror of itself: As with Cranfield’s reflection of the Beatles and the Stones, here Floyer’s work is about the mediation of music and the liminal zones between music, noise, and silence.